Written by Bonita Hutcheson and Roger B. Rowland for "Sheridan Celebrates" in September, 2004. Sometime between April 1890, when the Town of Sheridan came into being, and early April 1895, the Town Fathers managed to build a meeting place. At long last they were in a permanent home¾a cinder block building approximately 12 feet by 24 feet with a nice stucco finish. The interior was open with a small office in the back and a toilet. Outside in the back, but attached to the Town Hall, was the jail. Unfortunately the flood of 1965 inundated this building, soaking the town records with muddy water. Some were destroyed, but many survived, including the first three Minute books. These have been restored, but sadly many pages were lost or are illegible. The first pages are missing in Volume 1, so it begins with April 1895. They are interesting reading and filled with informative happenings in the city. There were two metal buildings on the west side of the Town Hall that housed the fire equipment. Later this was replaced by a single story cinder-block building. Late in 1964 a new two-story firehouse was built, mainly with the labor of the volunteer fire fighters. 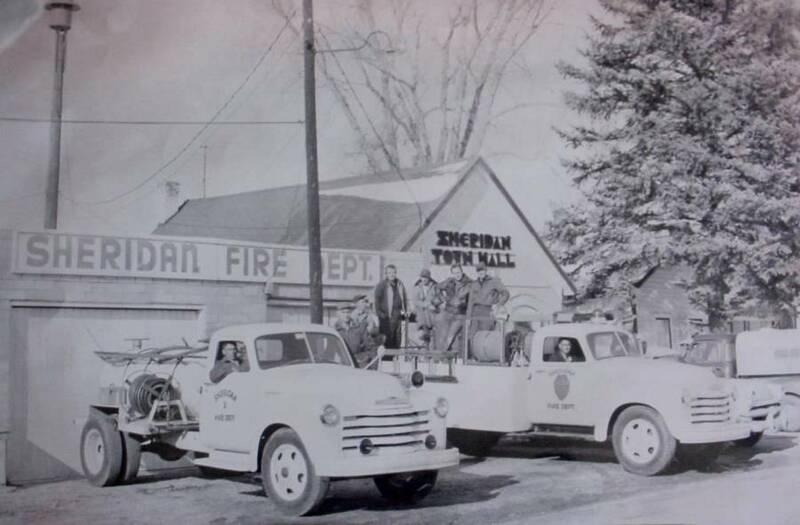 For more information on the Sheridan Fire Department, we recommend the newly published volume, The History of the Sheridan Fire Department, written by Roger B. Rowland and published by the Sheridan Historical Society. It seems that an election had been held that April of 1895 and Mrs. Lipps furnished the Registration Board and the Judges of Election with meals at a cost of $12.50. The practice then apparently was to come to vote, register and then cast your ballot. It was an efficient method for a small community where many of those voting were known to one another. Mr. J. A. Skerritt [of Englewood fame], who was then a resident and property owner in Sheridan, was on the Town Board, was allowed $1.00 to bury a dead dog. He also was paid $1.20 for placing booths for the election use. Other activities recorded then included J. S. Layton, who received $2.00 for services as the Peace Officer, the Town Clerk, James Spain, who was allowed a bill of $3.00 for having keys fitted to the ballot box, G. M. Thomas who presented a $4.00 bill as Special Officer and Mary Puff, who was allowed $1.50 for election supplies [no indication of what these were]. Ballots and other materials were purchased from Smith Brooks Printing, no amount listed. Special Constables were hired for Election Day at a cost of $20.00 each. Judges and Clerks of Election were paid a total of $68.20. There was a small mention of a document of disincorporation, which was received and filed. The newly elected officers were R. Borcherdt, Mayor; Trustees (for two-year term), Ed Rosenbusch, Chas Burkling and Geo Laher; Clerk and Recorder, James Spain; Treasurer, Patrick Sliney, and Marshal, J. E. McHall. Note the use of old time common abbreviations Chas for Charles and Geo for George. Many of these names show up in other records of the city, reflecting their levels of involvement as businessmen and activity in Town affairs. Mr. Sliney at one time and another ran or owned the hotel [grandly called the Star Hotel, and later the Mountain View Hotel] in "Logantown". Logantown was that area along Lowell up to the gates of Fort Logan, although it was situated in the Town of Sheridan. The other three trustees were W. E. Cotter, L. Geusler, J. A. Skerritt. Interestingly enough, there was an elected Mayor, but when officials made their appointments later in the meeting, they elected a Chairman of the Board-Ed Rosenbusch. Other appointees were Town Attorney Thomas McClelland and Police Magistrate Ed N. Bean. The official newspaper of the Town was the Littleton Independent. Committees of three were appointed for Finance, Street & Bridge, Common Animals Running at Large, Fire and Water, Lights and Public Buildings. All Trustees were assigned to one or more committee(s). In April 24, 1895, James E. McHall [the Town Marshal] was appointed as Janitor of the Town Hall and "such other town property pertaining, at a salary of $20.00 a month." The Board took a recess to inspect the bed and bedding in the jail. The bed was evidently in bad condition as they approved purchasing a bed and bedding. They also received Patrick Sliney's Bond, a requirement for the Town Treasurer, which was presented to the Town Attorney for investigation and report. At a special Meeting May 7, 1895, the Bond for Sliney was approved, and other bonds required including ones for Town Treasurer in the amount of $3,000, The Recorder, Attorney, Marshal, Magistrate, and Street Commissioner all set at $5,000. This was done by Ordinance 48.3. On May 29, 1895, Board met once a month at the end of the month and any additional meetings were special meetings. The Clerk was instructed by the Mayor to notify the Police Magistrate to hand in a report at once and also any moneys in his possession and due the town for fines, etc. Bed and bedding cost $11.25. They discussed the Town Pound. A bill to settle the question of disincorporation was presented by Mr. McBroom. The matter was referred to the Town Attorney. Eugene Croff, J. Johnson, and Wm. Fabian presented bonds for grocery and saloon licenses. These were accepted. The Town business continued as usual, with another election to be held in April of 1896. The minutes for that year reflect typical town business: disagreement among the Trustees, some citizens upset with the Town Board, and new names appearing. Old minutes are interesting and fun to read, telling us that nothing really changes in our Town-City-Home Rule City. In 1954 the Town became a first class city by virtue of population. So now the proud City Fathers were Councilmen, and there was a new feeling of pride. In June 1965 a 100-year flood came down the Platte River. It washed away the old bridge on south side of the highway, taking the highway bridge out and inundating the lower part of Sheridan. Many homes were lost, and the Town Hall was condemned, knocked down by a D-9 Cat Dozer. The new fire house, however, stood firm and was cleaned and restored. That left the Town without a meeting place. It was imperative to find a home soon. They settled on a small grocery store with adjoining house at 4001 S Federal Boulevard that was available on a lease purchase [it is thought]. The store building was slightly larger than the old Town Hall, having a small office in the back and toilet facilities, and, although the house was small, it was perfect for the Police Department to move into. Later the family room on the back of the house became the Building Department. The three employees, Marguerite Hokenson, Deputy City Clerk; Mona Armstrong, Bookkeeper; and Al Leise, who read the water meters, (and was also the building inspector, Janitor and handy man) had plenty of room. As in the old building, folding chairs were set up for Council and Court nights, by these three. Mona or Marguerite attended the Court sessions to take the fines and assist the Judge. Marguerite used to type eight carbons for the minutes as they did not have a copy machine. The typewriter had gone through the flood and had been cleaned, but it was a beast by the author's account. Floods continued to plague the city, with Bear Creek at record levels in 1969 and 1971. Bonita Hutcheson remembers sitting at City Hall with citizens manning the phones to tell people they had to evacuate and answer questions. The mobile home parks in Sheridan were in danger while the police and fire department were out helping people and monitoring the traffic. It was feared that the bridges at Lowell and Federal were likely to be taken out by the raging waters. Life flowed smoothly otherwise. Plans were made for a new City Hall as the old quarters were becoming crowded. Court and Council meetings overflowed the small room, there was a lack of record space, and the Police Department was bursting at the seams. Land to the south was available and this would give the city the south end of the block between Federal and Grove, except for a parcel on the corner of Oxford and Federal where a Shamrock Service Station stood and is currently Kit Vans Plus. An architect prepared preliminary plans. Funding would come from the recently approved Federal Government's Revenue Sharing Plan. Meanwhile, the City Clerk, Bonita Hutcheson, was attempting to get a business license from a firm at 4400 S Federal that had resisted buying one. The Police Chief, Dave Teich, accompanied her to the business to try to meet with the owner. The building was a large two-story white pre-stressed concrete building. Erected from parts supplied by Rocky Mountain Prestress, it was fully open span, so that room division was easily done. A front outside stair and a back inside stair led to the second story, with another outside stair on the north of the building. This led to a private apartment, living room with bar, bedroom, a full bath with a bidet, and was entered on the inside through a closet in one of the offices [Living quarters were not allowed in business buildings]. Many rooms had been divided in the east portion. The front room to the west on the main floor was a very large room, completely open, as was the second floor above it. But no owner was to be found and only a few tenants were in the building. Returning to the City Hall, both Bonita and Chief Teich raved about the size and availability of this building. Further investigation found that it was for sale at a reasonable price. It would suit the City need very well. After the Mayor and Council had inspected the building, which was about 32 by 80 feet, they decided to purchase it. The advantages being plenty of space, the building already erected, the cost was lower than building a new building and there was a nice paved parking lot on the south, and plenty of room to grow. In the early 1970s it was the newest home of the City and was entirely paid for by the Revenue Sharing Program on a lease purchase agreement. The City Hall offices were on the main floor in the west end in the large room, with rooms for record storage, a safe room, and a nice sized break/lunch room. The rest rooms were down the hall to the east and the Police Department filled the rest of the lower east wing. Upstairs from the City Hall offices were the Building Department and the Court/Council chamber, and the far west end with offices for the Court, Court Clerk, and a meeting room used for Executive Sessions, Jury sequestering, and other City meetings. However, the area selected for the Court/Council room was divided into offices. All officials and employees were invited to attend a wall destruction party. Many showed up with their sledge hammers, and other tools and they quickly removed the walls of those offices so that one large room remained. It was fun, dusty work, and an opportunity to work together for a good outcome. Later there was an office for the Bookkeeper upstairs as well. New furnishings were purchased with some of the Revenue Sharing Funds. It was nice to have desks for everyone, and new IBM Selectric typewriters and a copy machine. Even Marguerite Hokenson loved them. Marguerite moved upstairs to serve as the Court Clerk, and Dee Heath became the Deputy City Clerk. Dee had been with the City at 4001 as the Building Department Secretary under Inspector Pete Toedman. Dee remained as Deputy City Clerk, except for a short time in 1983. Later she returned as City Clerk and remained there until final retirement. In the mid 1980s this home was becoming a problem, since it did not meet the needs of the handicapped, the police were crowded and there was a strong feeling that they wanted to have the Fire Department as part of the Municipal Complex. The City decided that they needed a new City Hall. Roger B. Rowland, former Mayor of Sheridan lists the timeline for the acquisition, including the effects of the ups and downs of the economy and ins and outs of the legal quagmire the City found itself in. 7/2/85 Memo from City Administrator Curnes. This is the first item in writing discussing a new City Hall. The memo details possibilities for a new City Hall including funding. The memo was acknowledged in the City Council minutes of July 23, 1985. Sometime in 1985 Joint meeting with the school board. 11/12/85 First reading of Ordinance 33, Series 1985. The enabling ordinance for the acquisition and construction of the new City Hall. 2/19/86 Certificates of Participation issued in the amount of $3,500,000. 3/26/86 City and School District sign "Vacant Land Contract" including covenants. Sometime in 1986 Architect selected - Michael Barber Architecture. 7/8/86 Construction agreement was reached with the School District. 7/18/86 Property deed recorded by Arapahoe County Clerk and Recorder. "Vacant Land Contract" also recorded. Sometime in 1986 Joint use agreement with school district. Sometime in 1986 Ground breaking ceremony with City Council and School Board members present. 7/29/86 Grading contract is awarded to Bituminous Roadways. Grading work is completed by 9/9/86. 9/16/86 Construction contract is awarded to DPS Constructors. New City Hall will be about 28,000 square feet compared to 12,000 square feet of the old City Hall at 4400 S. Federal Boulevard. 4/18/87 Cornerstone laying ceremony is completed by the Masons. Sometime in 1987 Property deed is conveyed to trustee? 6/21/87 Move in. South cornerstone. Sometime in 1988 City refinances City Hall with new Certificates of Participation to take advantage of lower interest rates. Sometime in 1993 Pace Membership Warehouse closes and City loses one third of its tax income. Sometime in 1994 City terminates lease with bondholders (certificates) through trustee. 11/94 Trustee files suit in Ramsey County Court, Minnesota for instructions regarding short term lease. 12/94 Minnesota Court assumes jurisdiction and agrees to short term lease. 2/96 City commences eminent domain procedures. City offers $642,000 for City Hall facility. The trustee contested valuation. 11/5/96 Bonds election in the amount of $1,800,000 for the use in acquisition or construction of City Hall. Yes 653, No 219. 11/96 Colorado District Judge Deana Hickman rules that Sheridan has the right to condemn its City Hall. 4/~8/97 Minnesota Court orders rejection of city offer and ordered the trustee to contest the right of the city to use condemnation proceeding and valuation. 4/10/97 Ordinance introduced for General Obligation Bonds in the amount of $1,800,000. Bonds are issued for a period of twenty years at 7.5% interest. 9/19/97 City moves out of City Hall into leased facility at 3231 S. Zuni Street. 10/97 Trustee reports to Minnesota Court their attempts to lease the building have failed because "nature of facility, a deed restriction limiting the facility's use to governmental purposes, and zoning problems. 11/5/97 Bonds election to allow the use of the unused portion of bond proceeds. Yes 627, No 288. 4/98 City makes a new offer to settle all litigation and purchase City Hall for slightly more than $2,000,000. The certificate holders are polled and reject the offer. The trustee seeks direction from the Minnesota Court and is told by the court to accept the offer. The certificate holders appealed and the sale was upheld. 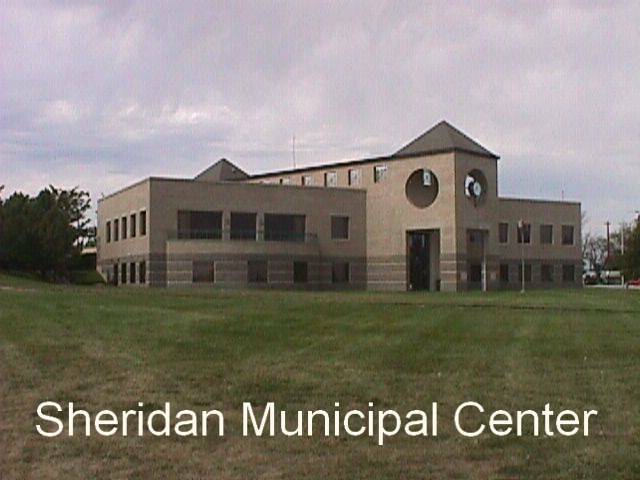 5/6/98 The City Council approved "pursuing a formal settlement agreement in the matter of the City of Sheridan, Colorado vs. First Trust National Association, et al..."
5/28/98 Agreement completed for buy back of City Hall. 9/28/98 City closes deal on the repurchase of City Hall at just over $2,000,000. This includes money already paid for acquisition of city street shop facility. 12/98 City moves back into City Hall. In 1992 Wal-Mart purchased the Pace Warehouse at the Corner of Santa Fe and Oxford and closed the store. The loss of this sales tax revenue was major and the City Fathers soon began having difficulty making lease payments for the 4101 Building. Even with cutting the number of employees, including the City Administrator, the city found it was no longer able to meet these payments. Once negotiations with the bondholders broke down, the City officials started looking for new quarters. They found a great building at 3231 South Zuni. It was quickly rented and on September 19, 1997, goods, materials and people were moved. Some renovations were needed to make it a home for all departments. As usual, the police were in the back section, the court/council chambers in the back south end, and the other offices in the front along Zuni Street. Evening entrance was through the police area. It was quite crowded. Perhaps this would have been a permanent home if the City had not been able to come to an agreement with the Trustee in December 1998 after many negotiations and new financing. But the 4101 building having been built as a municipal complex did not lend itself to other uses and costs to remodel it were large. The City moved back in and remains there to this day. In 2001 an election was held to elect a home rule charter committee. This committee worked very hard to frame a charter that covered all the needs for a Home Rule City. In 2002 the electorate approved this Home Rule Charter and the City became a Home Rule City.